The best kind of trades are those where the outcome is known with 100% certainty. You might wonder whether such trades exist. The short answer is yes, they do. These opportunities to make risk-free money are known as arbitrage opportunities and are the holy grail for all traders. Most crypto traders are familiar with arbitrage across spot exchanges, i.e. buy and sell a crypto on two exchanges with different prices. However, arbitraging across bitcoin futures exchanges is something that is not very well understood. Futures – Futures arbitrage across crypto derivatives exchanges is what I aim to demystify in this article. Read on! Can you arb bitcoin futures on Delta, BitMex and Deribit? How to track arbitrage opportunities in bitcoin futures? Can the bitcoin futures arbitrage be traded manually? Arbitrage is an opportunity to make riskless profit by taking advantage of the differences in price of a crypto asset across two or more exchanges. In traditional financial markets, such price discrepancies tend to be quite small and short lived because there are large number of traders (e.g. high-frequency trading, HFT firms) that are actively tracking and trading arbitrage opportunities. In contrast, cryptocurrency arbitrage opportunities are relatively abundant and are easy to exploit. There are two main reasons for existence of these arbitrage opportunities: (a) trading activity/ liquidity is quite fragmented because there are a plethora of exchanges with several access restrictions in place and (b) trading is dominated by retail participants and the arbitrage hunting algorithmic traders are yet conquer crypto trading. This is also known as direct arbitrage is the most basic type of arbitrage trade. Here, a trader notices discrepancy in price of bitcoin across two crypto exchanges. Obviously, the price of bitcoin should theoretically be same at all exchanges and hence such a price discrepancy presents an arb opportunity. To capture the arbitrage, the trader will buy bitcoins at the exchange where bitcoin price is lower and simultaneously sell the same quantity of bitcoins at the other exchange (where bitcoin price is higher). These two trades result in the trader pocketing the price difference as profit. The table below illustrates how such an arbitrage works in practice. The trader has balanced of bitcoin and USD on both exchanges and is able to capture the $50 price discrepancy between bitcoin prices on Kraken and Gemini. From the discussion above, it is clear that the basis for the spot-spot arbitrage is one fundamental truth: a bitcoin is a bitcoin and hence its price should be the same everywhere. Can the same be said about bitcoin futures contracts? Answering this question requires some understanding of futures contracts. A futures contract is derivative contract in which two parties agree to buy/ sell an asset at a pre-specified price and future date. A futures contract is actually comprised of an expansive set of specifications that govern the behaviour and nature of the contract across all scenarios. You can see a real life example of this on the contract specifications page of Delta Exchange. Underlying of the futures contracts is identical: Price of a futures contract is predominantly driven by the price of the underlying. in case of crypto futures exchanges, the underlying is typically formed by combining prices from prominent spot exchanges. So, bitcoin futures where spot prices are sourced from the same exchanges are likely to have very similar prices. The maturity of the contracts is close to each other: The defining feature of a futures contract is that its price converges to the price of the underlying at maturity. So, if for two bitcoin futures the underlying is identical and maturity is same, then their prices would converge with other each at the time of maturity with 100% certainty. This means that any price discrepancy between the two futures contracts will certainly go away at maturity. 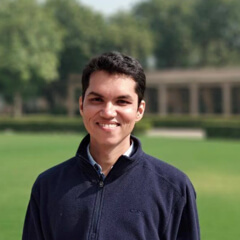 Margining and settlement currency is same: This will required to ensure that profits and losses on both the contracts are denominated in the same currency and can offset each other. 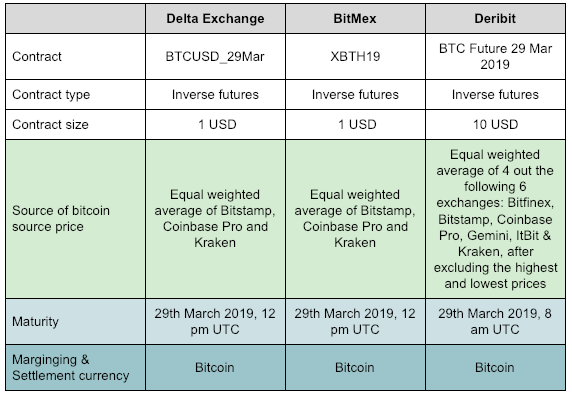 Let’s compare the March bitcoin futures listed on the three exchanges across the three dimensions mentioned above and see if there is a possibility to run future-futures arbitrage strategies on these exchanges. The specs of bitcoin futures contracts on Delta and BitMex are identical. On Deribit, the contract is defined slightly differently, but the differences are small enough and can be ignored for practical purposes. So, futures-futures arbitrage is indeed feasible between any two of the three exchange. Let’s consider a situation where BTCUSD_29Mar on Delta is trading at $3400 and its counterpart, XBTH19 on BitMex is trading at $3410. Since, the bitcoin futures on Delta is cheaper than on BitMex, the arbitrage trade would be go to long BTCUSD_20Mar on Delta and short the same quantity of XBTH19 on BitMex. Goes without saying that you’d need to pre-deposit bitcoins in your Delta and BitMex wallets to be able to make this trade. Let us know analyse the possible outcomes of this trade. In this scenario, the prices of the two contracts converge after some time. Typically, this convergence happens within minutes. In this scenario, the convergence doesn’t happen till there is trading going on in the futures contracts. Here the contract maturity will come to our rescue. Recall that at contract maturity, the price of a futures contract converges to the price of the underlying. Since, both BTCUSD_29Mar of Delta XBTH19 of BitMex have the same underlying, the prices of these two contracts will be the same at contract maturity. The PnL (profit/ loss) of this trade is not dependent on direction of bitcoin price. If the trade on Delta Exchange will be loss making, then certainly the BitMex trade would be profitable, and vice versa. The duration over which the arbitrage trade plays out is not known with 100% certainty. In most situations, the pricing discrepancy will get corrected in minutes. In the worst case scenario, the trade will be live until the contracts expire. For the sake of simplicity, I have not included trading fees and slippages in the above analysis. Price moves unfavourably: This leads to erosion of position margin and eventually liquidation of the position. Higher the leverage a trader deploy, greater is the probability of liquidation. Position is auto-delevered: This is a feature specific to Delta Exchange and BitMex. Auto-deleveraging kicks in when the exchange is unable to liquidate a position in the market. In this situation, the liquidation is achieved by forcefully matching this position with counter-parties on the opposite side. Parties that are auto-delevered are forced to close their profitable positions. Both liquidation and auto-deleveraging are risks for the arbitrage trade because capturing arb profits (without assuming any risk) requires the trader to have equal and opposite positions on the two exchanges. If a trader is running futures-futures arbitrage strategy, she will need to monitor her positions and manage liquidation and auto-deleveraging risks. The ability to arbitrage price discrepancy across exchanges requires a trader to maintain balances on multiple exchange. This is true for both spot and futures arbitrage. However, spot exchanges do not offer leverage. Whereas, futures have inherent leverage built into them. Availability of leverage means that the lower amount of capital needs to be maintained in exchange wallets. In the case of bitcoin futures, all the three crypto derivative exchanges viz. Delta Exchange, BitMex and Deribit offer up to 100x leverage. Futures exchanges typically have higher liquidity compared to spot exchanges. Higher liquidity means lower slippage costs. And, lower slippage costs mean higher probability of capturing the full returns of any arbitrage opportunity. In a spot arbitrage trade, arbitrage profits are locked instantly as the trader executes equal and opposite trades on two different exchanges. However, in a futures arbitrage trade, the trader ends up with equal and opposite open positions on two futures exchanges. Both these positions will remain open until the price discrepancy which led to the arbitrage gets corrected. Typically this happens within a few minutes, but in the worst-case scenario, the trader might need to hold these positions till the maturity of the futures contracts. Due to the built-in leverage, a futures position is exposed to the risk of liquidation. Further, on some of the crypto derivatives exchanges (e.g. Delta Exchange and BitMex), a futures position can also be auto-delevered. For the arbitrage trade to work, opposite positions must be maintained on the two exchanges. In the event of involuntary closure of position on one of the exchanges, the position needs to be re-opened immediately. Any delay in this can lead to slippages which might eat away the arbitrage profits. Crypto markets are open 24/7/365. Arbitrage opportunities can come up at any time. To make it easy for traders to track and capitalise upon such trading opportunities, we have created a system that continuously monitors prices of bitcoin futures (as well as futures on altcoins) and sends alerts in real-time whenever an arbitrage opportunity comes up. These alerts are sent on Telegram and Twitter. Please join this telegram channel and follow this twitter account to get these alerts. Given the competitive nature of cryptocurrency trading, arbitrage opportunities are keenly observed by a multitude of traders. As many traders nearly simultaneously act to capture arbitrage opportunities, the price discrepancies start to get corrected. We have observed that in the case of bitcoin futures-futures arbitrage, the price discrepancies typically last for a few minutes. So, if a trader has balances on each of Delta, BitMex and Deribit, she has time to place arbitrage trades. However, time is certainly of the essence and the delay between arbitrage becoming available and trade execution can lead to slippage. Therefore, it is best to run arbitrage strategies programmatically.